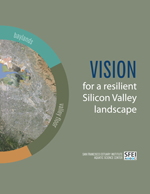 We worked with a team of regional science advisors to develop a vision for landscape resilience across the streams, hills, baylands, and urban areas of Silicon Valley. To do this, we are applying our Landscape Resilience Framework to identify landscape elements that would contribute to resilience in the region. Ultimately, we hope this vision will provide a shared foundation, aligned with other regional planning efforts, to catalyze discussions among scientists, planners, managers, designers, and others about specific actions that could improve landscape resilience. In Silicon Valley, oak ecosystems were the defining feature of the landscape before large-scale transformation. Oak savannas and woodlands were so extensive that the valley was christened the Llano de los Robles, or Plain of the Oaks, by early explorers. In little more than a century, Silicon Valley’s oak woodlands were felled, replaced with orchards, and then replaced again with a patchwork of urban trees. The rapid and continuing transformation of Silicon Valley creates an unusual opportunity to recover some of the region’s natural heritage by re-incorporating elements of oak woodland ecosystems. These changes could contribute to building landscape resilience in the region, increase biodiversity, and benefit people. Much of Silicon Valley's urban forest, planted 50-75 years ago, is nearing the end of its lifespan. Over the next few decades, local communities will create the next urban forest, shaping the sense of place, human health, and biodiversity of Silicon Valley for the rest of the 21st century. Given the challenges of drought and climate change, do Silicon Valley's native oaks – largely gone for a century – have a greater role to play in the coming century? Our report, Re-Oaking Silicon Valley, begins to explore that question, focusing first on the benefits the re-oaking could have for local biodiversity and native wildlife. Learn more about SFEI's broader re-oaking project.